Incorporated in 1980, the full-service City of Poway, California is a truly unique community in northeast San Diego County. This general law city operates under a Council/Manager government and is home to around 48,400 residents. You’ll find this, “City in the Country” just west of Highway 67 and three miles east of Interstate 15. Composed of 39.4 square miles, over half of which is dedicated open space, Poway is a wonderful place to work, live and play. Residents enjoy quick and convenient access to freeways, to Mexico, and to the Riverside, Orange and Los Angeles counties. This remarkable city also boasts the lowest overall crime rate in the county, and one of the lowest in the state. Among Poway’s many other exceptional features and amenities, it boasts an extraordinary school district, a vibrant business park employing 19,000 people, fifty annual community events, several picturesque parks, great public transportation, close proximity to the San Diego International Airport, and a wide array of splendid shopping and dining options. The Power Unified School District, which serves the city, encompasses 100 square miles, serves around 33,000 students and operates four comprehensive high schools, one continuation high school, six middle schools and twenty-two elementary schools. It is the third largest district in the state and eleven of its schools, all highly ranked and rated, are located in Poway. In addition to excellent schools, Poway is also known for its excellence in business. In fact, Outlook Magazine ranked Poway the 6th best city in the state to locate a business. The aforementioned business park is a mix of retail and commercial space and is home to the headquarters of Toppan Optical Products Inc., First American Credco Corporation, Geico Direct Insurance and Sysco Foods. This one-of-a-kind community also has some truly wonderful recreation opportunities. Whether swimming at The Swim Center or fishing and boating at Lake Poway, you’ll never run out of ways to stay active. The city has several multi-purpose gymnasiums for volleyball, badminton, and basketball, as well as fifty-five miles of some of the finest hiking, biking, and horseback riding trails in Southern California. 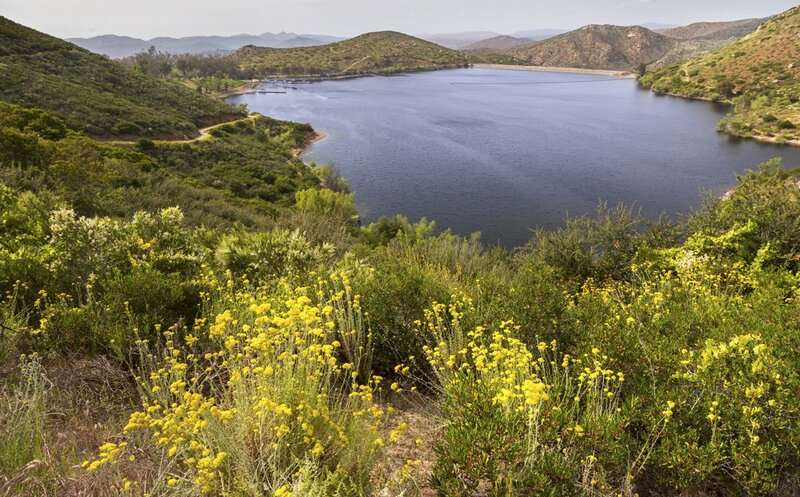 Among the most popular trails, you’ll find Blue Sky Ecological Reserve Trail, Creekside Trail, Ramona Dam and Mount Woodson. The city also provides a variety of neighborhood parks, recreation parks and ecological reserves that afford opportunities for a variety of activities. In the heart of Poway you’ll find one of the most active parks, Community Park. Community Park encompasses a skate park, dog park, adventure playground, and senior center. Those interested in arts and culture will love the Kumeyaay-Ipai Interpretive Center, Poway Center for the Performing Arts and the Poway Branch Library which is an extension of the San Diego County Library. The city also hosts multiple family-friendly events and festival each year to engage and entertain the young and young-at-heart. Among the most popular are the Youth Fishing Derby, Old Fashioned 4th of July, Train Song Festival and Christmas in the Park. All in all, Poway provides a very high quality of life and equally high standard of living, all in close proximity to San Diego and all of its exceptional theaters, professional sporting events, museums and world-famous attractions like the San Diego Zoo, SeaWorld and dozens of gorgeous beaches, mountains, and deserts. All things considered, is it any wonder Poway, California is such a popular destination among luxury home buyers? In the 92064 zip code of Poway, you can find absolutely stunning luxury homes for sale, including equestrian estates, expansive acreages, gated properties and elegant homes with panoramic views. There are also some opulent Poway real estate opportunities in close proximity to Maderas Golf Club. If you would like more information regarding luxury properties in Poway, California, please do not hesitate to contact us today for assistance.